Urge me no more appears in three sources: a late seventeenth-century manuscript now in Chichester Cathedral Library, another in Christ Church, Oxford, and, probably the earliest of the three, one now held in the British Museum where the manuscript is dated December 1682. The text, however, uses language and metre of eighty years earlier and appears to come from a play which may have been written around 1600; perhaps one of the late choirboy plays. Purcell’s setting is extremely fine and is especially full of graphic word-painting, similar in style and content to some of the best devotional songs in the church music. We are never told why the poet is so miserable, but the colourful descriptions of his low state and references to music and musical instruments inspired the composer. In the opening phrase the voice leaps an octave and a half from ‘Urge me no more’ to ‘this airy mirth’; we are told that now is not the moment for music, which belongs to more cheerful times The ‘sprightly twang’ of the lute is prefaced by four continuo chords, and the ‘untun’d fortunes’ are prefaced by a tortured harmonic shift. Music, we learn, as an artificial contrivance (‘strains that are constrained’), exacerbates the natural, unconstrained experience of genuine grief. The poet’s emotions rise at the outburst ‘My grief’s too great for smiling eyes’, and there follows an extraordinary list, much in the style of Abraham Cowley, of the noises that would make suitable ‘music for these times’. Purcell illustrates each grim sound: the ‘dismal croaks’ of ravens, wolves howling, owls screeching and, poignantly scored, the sad tolling of a funeral bell. If we knew the source of the text, the significance of the ‘nine sad knolls’ – not a usual number – might become clearer. The key centre moves still further away from the starting point into the final ‘horrid outcries of revenged crimes’; a combination of all these sounds, ‘Join’d in a medley, is music for these times’. 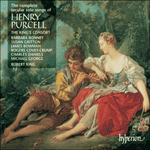 Purcell’s harmonization of ‘music’ could hardly be more tortured. A sad minuet ‘These are no times to touch the merry strings Of Orpheus’ concludes the song, though not without a pun on the word ‘relish’, which in music also meant a grace note or appoggiatura. To better times, these times are not for songs. Of strains that are constrained afford no pleasure. To cure or counter charms to exorcise. Join’d in a medley, is music for these times. Of Orpheus, no. Ah! no, these are no times to sing. That cannot speak for sobs nor sing for tears?